The Body Tuners are the ideal beginners set. The most powerful tuning fork combination, the C and G tuners create a perfect fifth and open the gateway for healing and higher consciousness. Listening to these two different tones, your body makes one tone, bringing your whole nervous system to balance and integrating your mind and body. Within 30 seconds (the same amount of time it takes to stretch a muscle), you can achieve a state of deep relaxation. From Dr. John Beaulieu: "One day I brought two tuning forks into the chamber and tapped them together. Immediately I observed that the sound of my nervous system realigned to the sound of the tuning forks. It was then that I realised that people can be tuned like musical instruments!" Body Tuners £53.00 plus £3.90 postage in the UK. Details at hillcrest01562.co.uk. Tune your body to the healing sounds of Pythagorean Tuning Forks. With this set of eight tuners, you achieve fast, instantaneous relaxation as well as develop and refine your sonic abilities. The Solar Harmonic Spectrum helps you re-proportion your body through a process of cellular memory based on the natural ratios of the tuning forks. 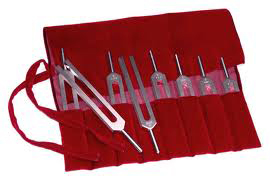 This set contains a full octave of tuning forks (C, D, E, F, G, A, B, C). When played together they create a series of overtones to help you relax and centre yourself. Each interval relates to a different state of consciousness and body posture. Each interval affects your nervous system in a different way by activating specific elemental qualities. Solar Harmonic Spectrum £169.00 plus £3.90 postage in the UK. Details at hillcrest01562.co.uk. There are two ways to sound your tuning forks. The first way is to gently hold them by the stems and firmly tap the end of the tuning fork on your knees. This will create a pure tone and is excellent for deep listening. Bring the two-prong part of the forks about an inch away from each ear and listen to the quality of tone. The second way is to hold the tuning forks by the stems and tap them together two times to create an audible sound with overtones. This sound is good for moving around the body in the energy field. You can adjust the volume by the strength of your tap. Experiment with getting different sounds. When you move the tuning forks quickly they will create a beautiful ringing overtone. 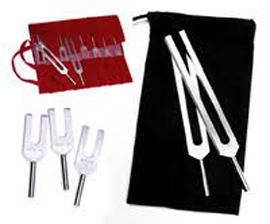 Remember that the tuning forks are musical instruments that need your expression and creativity to be empowered. The Tuning Forks are available from EcoEnergies, for details please email Keith Oddy, telephone 01562 741 743 or visit hillcrest01562.co.uk. Body Tuners £53.00 plus £3.90 p+p in the UK, carriage at cost (quote on order) overseas. Solar Harmonic Spectrum £169.00 plus £3.90 p+p in the UK, carriage at cost (quote on order) overseas. Cheques payable to 'EcoEnergies'. Most major credit cards accepted.